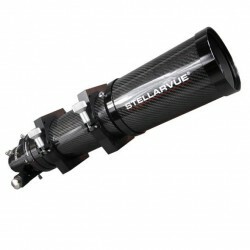 The SVR102T has been designed as Stellarvue's best dual purpose 4-inch telescope for both visual and photographic use. This instrument delivers stunning visual performance thanks to its high Strehl, fully multi-coated objective. Photographic performance is excellent with the addition of the photographic field flattener. The Stellarvue SVR-102T is among the sharpest 4-inch class telescope ever offered. Fully Multi-Coated Apochromatic Triplet Objective: Using a 101.5 mm f/7 apochromatic triplet objective with an Ohara FPL-53 center element, the Stellarvue SVR-102T refractor provides extremely high contrast and reflector-like color correction. This triple-tested lens is as well corrected as any a 4-inch APO triplet Stellarvue has ever offered, and it comes with an interferometric report to prove it. To further enhance this high level of contrast, extreme broadband multi-coatings are used on all six air-to-glass surfaces. This boosts contrast, making the stars appear vivid and the background velvety black. These coatings transmit light above and below the visual spectrum. This is an important quality, as it minimizes the reflections that can be seen on CCD images. Lightweight Carbon Fiber Tube Assembly: The thin wall carbon fiber tube looks sharp and matches the black anodized aluminum fittings, giving this telescope a very high-end, classy look. The starting weight of the OTA with the standard focuser is only 8.8 pounds, making this the lightest 102 triplet Stellarvue has ever made (The 3-inch Feather Touch focuser will add a bit to this weight). The dew shield retracts reducing the length of the telescope when being stored. When the telescope is used, this dew shield may be extended to minimize dewing of the objective at night and to serve as a glare shade during the daytime. Since the focuser can be easily un-threaded, the telescope length can be reduced to airline carry on size. This means you can now carry your high end APO on the plane with you. Internal Tube Treatment: The main tube interior is painted ultra flat black inside and is properly baffled to eliminate any tube wall reflections. Reflections in the optical path are further reduced by using edge-blackened objective elements. All of these methods are used to preserve the outstanding contrast of this exceptional apochromatic lens. Feather Touch 3-Inch Focuser: This version of the Stellarvue SVR102 comes with a Feather Touch 3-inch fully rotating focuser with 2-inch and 1.25-inch adapters. This is not a Chinese focuser with a Feather Touch dual speed mechanism but the actual, American made Feather Touch focuser. This focuser is made to work with the Stellarvue SFF3-3FT field flattener for small, medium and large chip imaging. Aluminum Hinged Rings: The Stellarvue SV102T telescope comes with their American-made CNC aluminum mounting rings. Each ring has five screws top and bottom. Threaded holes are 1/4-20. There is one center hole, two holes spaced 1.5-inch apart and two holes spaced 60 mm apart. Use the optional TP-10 rail for telescope mounts using the Vixen style rail or use the optional TP6 for mounts that use the larger Losmandy style rail.